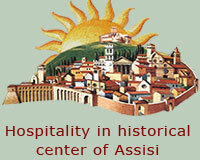 The Umbrian Valley was once so rich in almons and hazeb-nuts that it is still remembered for the show of its trees in bloom. This abundance gave birth to recipes which have these fruits as main ingredients and which match very well typical liqueur wines. Little gourmet pastries of soft almond paste, flavoured with pistachio and covered with a thin layer of toasted almonds. Almond Tozzetti well known and enjoyed in central Italy, these cookies containing whole almonds go well with tea or a good Passito as dessert. Tozzetti with almonds and whole filberts as the cod. D2 but with the addition of pistachio for a richer taste pleasantly. 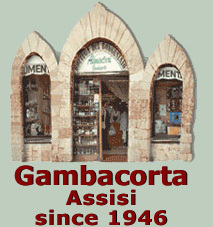 According to the tradition they are tasted with vinsanto or with the thè. An unusual preparation of sugar, pine-seeds and cocoa, produced only in the province of Perugia, it is a typical winter sweet available until January. It not resemble any other kind of sweets and there is nothing like it on the market. It should certainly be tried. Puffed spelt, fine milk chocolate and sugar, principle ingredients of these simple, pleasant, lightly flavoured nourishing biscuits. 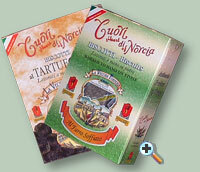 Black truflle of Norcia is delicious component for truffle biscuits. An imaginative and delicious creation containing chocolate and pieces of black truffle. An absolute delight. Pampepato is made with almonds, candied fruit, honey and grains of black pepper a pleasant combination of sweet and hot flavours to accompany and be eaten with a good Passito wine. Pangiallo has a unique characteristic, the use of maize flour together with almonds, candied fruit and honey. 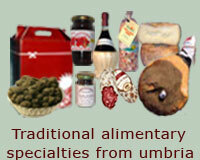 The flavour is rich, delicate and reminiscent of simple, ancient Umbrian recipes. Panforte of confectionery with ingredients principal almonds and candied fruit, handmade produced the whole year with traditional methods. 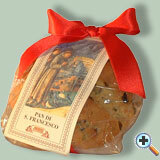 A simple, ancient Umbrian sweet bread, enriched with sultanas, to enjoy with a cup of tea at breakfast or as a dessert. A nougat of confectionery with filberts, cocoa and black truffle of Norcia, produced with handicraft method in Valnerina, it unites to the classical ingredients of the nougat the perfume and the taste of truffle. 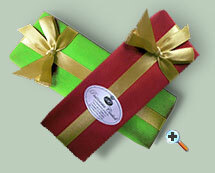 Torrone a handmade, confectio- nery product of carefully selected ingredients, originally white and chocolate in slices of 2 x 240 gr.